Radical Transformation May Be the Only Way to Save Some of Today's Most Successful Enterprises, Says New Book "Dual Transformation: How To Reposition Today's Business While Creating The Future"
LEXINGTON, MA--(Marketwired - Apr 19, 2017) - They are household names, some more than a century old. Ford Motor Company, Aetna, Johnson & Johnson, Singtel, Adobe, Xerox, Netflix, Intuit, Brigham Young University-Idaho. They come from different industries and span the globe, but have one thing in common: each has confronted threats to its business model and the need to radically change its business in the face of major disruption. Big disruptions have upended markets for mobile handsets, personal computers, cameras, newspapers, books, magazines, music, broadcast television and so on -- felling a long list of well-known companies along the way. 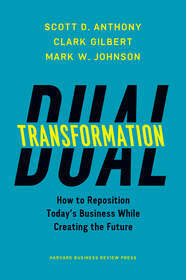 The most viable response to such radical disruption, according to the authors of the book Dual Transformation: How to Reposition Today's Business While Creating the Future (Harvard Business Review Press, April 2017), is a two-track process: transforming the core business to enhance and extend its life, while building a new and different business to power the future. This kind of "dual transformation" depends on leveraging an established company's unique difficult-to-replicate assets such as brand, scale, and decades of accumulated know-how. By sharing these capabilities and assets between the efforts, the established can come out on top, and help define the future. Consider the challenge facing automakers: autonomous vehicles and web-based ride-share services are threatening their traditional business model. In response, the 113-year-old Ford Motor Company is evolving from a "car company" into a "mobility services" business. "Cars" will be just one component of a very different business model. "In every mature industry, incumbent leaders are extremely vulnerable to competitors offering greater simplicity, convenience, and affordability," says Scott Anthony, managing partner at growth strategy consulting firm Innosight. "And those at the top of their game are most vulnerable." "Dual transformation offers a way to fortify a core business that has brought past success -- maximizing its relevance and resilience," says Anthony. "But it's also a way to leverage disruption and find strong growth in a new and under-served market. Growth that will power the company into the future." Adobe: Cloud-based "software-as-a-service," with greater affordability and flexibility, revolutionized the computer software business. To survive, and find new growth, Adobe had to transform: Its core business became subscription software services (for content creation), with growth powered by a new digital marketing business (for content distribution). Aetna: Anticipating a radical shift toward wellness-based and value-based health care, Aetna is transforming its business model: away from "insurance," toward population health management, disease prevention, and pricing for value. Singtel: In response to radical change, the Singaporean telecomm company, and Southeast Asia's largest mobile provider, transformed its core business model from voice to data, and launched a venture investment division to exploit growth opportunities in new technologies and applications. "Dual transformation is very different from typical CEO challenges, like restructuring, or downsizing, or a new product innovation," says Clark Gilbert, co-author and president of Brigham Young University-Idaho. "It forces the CEO to work deep in an organization's culture to build two truly new business models simultaneously." Auto insurance: Driverless cars should have far fewer accidents. What does that do to the business model of insurance companies whose revenues depend on the auto market? Long-distance shipping: When 3D printers make small-scale local manufacturing cost effective, what happens to companies that ship millions of tons of manufactured goods over long distances? Consumer banking: With e-payments offered by a wide range of non-bank companies, how soon will consumers "cut the cord" with banks, like they're doing with cable TV companies? White-collar work: Professional jobs are being lost to robots and algorithms in insurance claims, securities trading, medical diagnostics. Today even robots are writing the news. 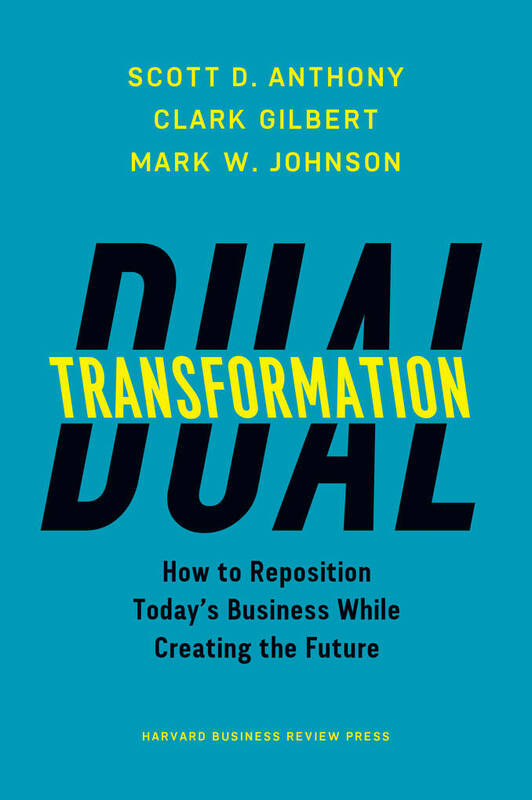 Dual transformation addresses one of the biggest mistakes that today's business leaders make: a present-forward view of strategy that is based on the assumption that the future will resemble the past. As a result, their growth strategy becomes rooted in today's business and today's data. When change is too incremental, businesses sooner or later end up defending an obsolete business model. Dual transformation builds on a "future-back" view of strategy, by contrast. This begins with the assumption that tomorrow will be different than today, involves looking at powerful trends that hold transformational potential, coming to consensus about the future environment, and developing shared aspirations about the company's future state. "Business leaders have to imagine the future and begin creating it, today, in both the core business and the new growth business," says Mark Johnson, co-founder and senior partner at Innosight. "They have to imagine what the company's markets will look like in five, or ten, or twenty years; design a company that can be successful in that future; and transform today's company right now, so it can still lead when that radically different future finally arrives." For more information, a copy of Dual Transformation: How to Reposition Today's Business While Creating the Future or an interview with Mark Johnson and Scott Anthony of Innosight or Clark Gilbert of BYU-Idaho, please contact Katarina Wenk-Bodenmiller of Sommerfield Communications at +1 (212) 255-8386 or Katarina@sommerfield.com. Scott D. Anthony is the Managing Partner of Innosight. Based in the firm's Singapore office, he leads its Asian consulting operations and its venture-capital investment activities (Innosight Ventures). He has worked with clients ranging from national governments to companies in industries as diverse as health care, telecommunications, consumer products and software. He is the author of The First Mile (Harvard Business Review Press, 2014), The Little Black Book of Innovation (Harvard Business Review Press, January 2012) and The Silver Lining (Harvard Business Review Press, 2009). He is the co-author of Seeing What's Next (Harvard Business Review Press, 2004) and The Innovator's Guide to Growth (Harvard Business Review Press, 2008). Mark W. Johnson is Cofounder and a Senior Partner of Innosight, which he co-founded with Harvard Business School professor Clayton M. Christensen. He has been a strategic advisor to both Global 1000 and start-up companies in a wide range of industries, including automotive, health care, aerospace/defense, enterprise IT, energy and consumer packaged goods. He has also advised Singapore's government on innovation and entrepreneurship. He is the author of the best-selling book Seizing the White Space: Business Model Innovation and Growth and Renewal (Harvard Business Review Press, 2010). Clark G. Gilbert is the 16th and current president of Brigham Young University-Idaho. He served previously as the CEO of both the Deseret News, Utah's longest running business and one of the nation's fastest growing businesses, and Deseret Digital Media. Clark is a former Professor of Entrepreneurial Management at Harvard Business School and an associate academic vice president at BYU-Idaho. He is also a founding partner of Innosight Ventures, where he has served as a founding director of several health care and media startups. Innosight, the strategy and innovation business of global professional services firm Huron, helps organizations design and create the future, instead of being disrupted by it. Acquired by Huron in 2017, Innosight is the leading authority on disruptive innovation and strategic transformation. The company collaborates with clients across a range of industries to identify new growth opportunities, build new ventures and capabilities, and accelerate organizational change. Learn more at www.innosight.com and www.huronconsultinggroup.com.